Clove | Become Healthy or Extinct! 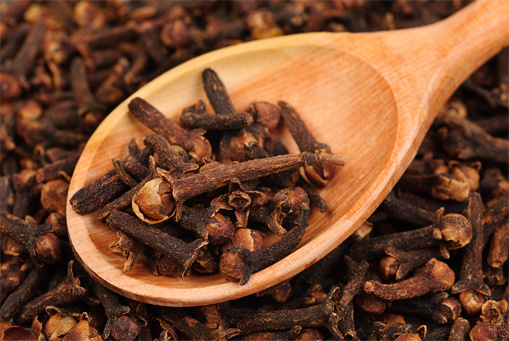 Of all the culinary spices, Clove has the most potent anti-inflammatory, anti-bacterial and antioxidant properties. This is the reason you may see it as an active ingredient in many internal parasite killing preperations. It provides relief against muscle pains from injuries, arthritis and rheumatism. It contains Eugenol and its mild anesthetic benefits are useful for toothaches, gum pain and sore throats. It also offers relief from respiratory ailments such as asthma and bronchitis, and eliminates intestinal parasites, fungi and bacteria. One of the convenient ways of getting a dose of clove would be to add a tiny pinch of it to your Green Tea or sprinkle a tiny pinch of it in your raw vegetable / fruit juice.